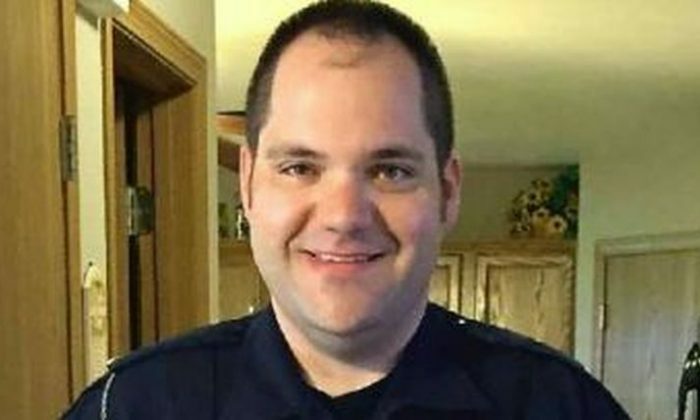 The Missouri police officer who was shot in what has been described as an ambush-style attack will never be the same again. The Ballwin Police Department said in a statement on July 18 that the bullet that struck officer Mike Flamion in the neck on July 8 “caused a catastrophic injury,” and will leave him paralyzed from the neck down. Flamion is still in an intensive care unit at a nearby hospital, police said. “Officer Flamion is alert and recognizes his family, friends, and coworkers. Because of the injury, he is ventilated. He is able to answer yes or no questions by nodding his head and attempts to mouth words when communicating, which is hampered by his ventilation,” the police department said. The department also said that the community in Ballwin as well as “from around the world” have been overwhelmingly supportive of Flamion, a nine-year veteran of law enforcement. The police department set up a GoFundMe account for him, raising more than $255,000 so far. For the shooting, the St. Louis County Police Department arrested Antonio Taylor, 31. Taylor was charged with first degree assault on a law enforcement officer, one count of armed criminal action, and one count of unlawful possession of a firearm. He is being held on a $500,000 bond, Ballwin Police said. Taylor was taken into custody after fleeing the scene of the shooting, officials said. Taylor, a convicted felon, allegedly stepped out of his vehicle and shot Flamion during a traffic stop. The shooting came just a few days after five officers were shot and killed in Dallas amid protests about police-involved shootings of two black men in Louisiana and Minnesota. On Sunday, three police officers in Baton Rouge, Louisiana, were shot and killed by a former Marine, Gavin Long, from Kansas City, Missouri. At a press conference on Monday afternoon, Louisiana Police Superintendent Mike Edmonson said Long deliberately targeted officers.